Cicadas feature in both mythology and cuisine and provide the soundtrack for the dog days of summer. This time of year, cicadas emerge from the ground as mature nymphs that molt into their adult form while clinging to nearby trees. Below are some images of a Medlock-bred cicada of the genus Tibecen. Recently emerged cicada (left) and the exoskeleton it wore as a nymph. Notice the vertical slit on the nymph's exoskeleton through which the adult emerged. Also note bits of dirt and sand on the molted shell, pointing to the nymph's recent whereabouts. Click to enlarge. As found, and approximately 2.5 hours later. Click image to enlarge. We come in peace! Notice the large compound eyes at either side of the head and between them, the ocelli (set of 3 simple eyes that detect light). Click image to enlarge. This is a female and won't be singing for us. With some luck, her sons will serenade us next year. Not coincidentally, the cicada killer is also a common sight this time of year. 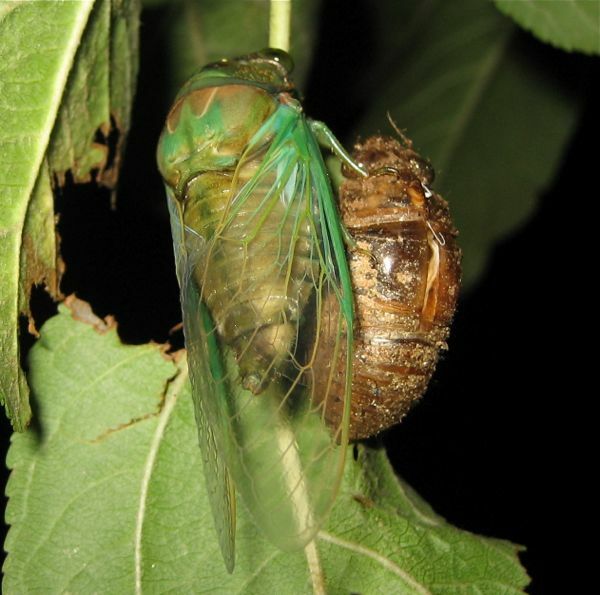 With a modus operandi that would get glowing marks from Hannibal Lecter, the female cicada killer immobilizes its prey before bringing it home. Following a crash-like landing while holding prey often twice its size, the cicada killer spirits its live cargo underground. The burrow has multiple chambers and the wasp's larvae will feed on the immobilized cicadas. These larvae will develop underground and emerge as adults the following year. In spite of its menacing size, the cicada killer is not very aggressive and mostly ignores people, but is still capable of stinging if mishandled. Adults feed on nectar. Males guard their territory and can be seen perched on tall grasses or shrubs, ready to chase away perceived competitors.